It's hard to believe, but summer break is more than halfway over for many school districts across the country. For Food Service Directors, this means it's time to start thinking about, and planning for, the start of the new school year. Remember that POS terminal, covered up and tucked away in the corner of your cafeteria? Pretty soon it will be time to dust it off and make sure it's ready for serving on the first day of school. To help with this process, we've compiled an essential checklist of all the items you should review before waking it up from its long slumber. Many cafeteria POS systems require you to perform a year end rollover before the new school year begins. This process typically backs up your data and closes out your reporting for the previous school year. If you're not sure whether your POS system needs to be rolled over, please check with your vendor for assistance. Most likely, your district has been busy enrolling new students and added staff over the summer. 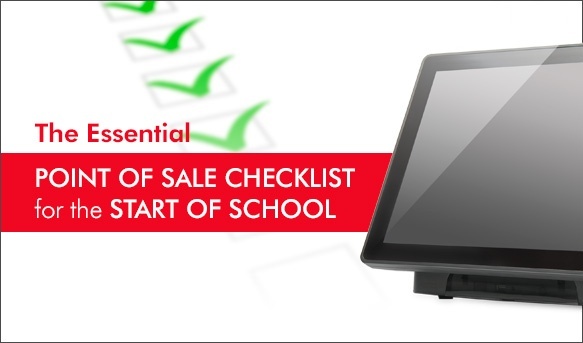 Make sure they have been added to your POS system so their accounts can be accessed on the first day of school. They can be added manually, or imported automatically by creating an export file from your Student Information System (SIS). Check with your SIS administrator to see if this can be provided. Then work with your vendor to import the file, if needed. Review the users who have access to your POS system. Do you have staff who are no longer with you? Are there new staff that need to be added to the system? Here's your chance to get rid of items you no longer use and add new items your cashiers might need access to. You can also use this opportunity to optimize your menu boards or make other changes that'll help speed up your serving lines. Many times credit (charging) limits directly correspond with meal prices. For instance, if a full-priced meal costs $2, you might set the limit to $6, or the equivalent of three meals. If meal prices increase, you will want to adjust the limit as needed. Check with your vendor to make sure you're running the latest version. These updates often contain important program enhancements and fixes to help ensure your system runs smoothly. If your district accepts online payments through a service like MySchoolBucks, make sure payments are enabled so parents can start funding their students meal accounts. Make sure all your staff know how to use your POS system from day one! This is also a good opportunity to review best practices and cafeteria policies that you want them to abide by.